M8 is a spectacular emission nebula where numerous stars are being born. In this photograph, you can see many Bok globules - these are the distinct dark spots. Each of these Bok globules is a location where clouds of gas are condensing into protostars. 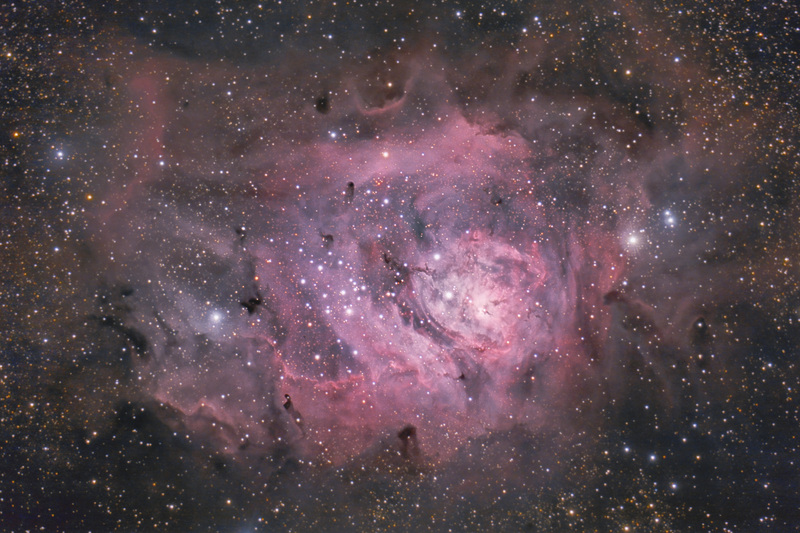 At magnitude 6.0, the Lagoon Nebula is easily visible from a dark sky as a cloudy 1 degree patch in the Milky Way. In this image, North is Up. This image is cropped to 94% of the original full frame. Software Used Images Plus 4.5 for camera control, calibration, stacking, digital development, multiresolution sharpening, smoothing and noise reduction. Photoshop CS5 used for levels and curves, color correction, high pass filter, star shrinking, saturation adjustments, match color, selective color, sharpening, screen mask invert, HDR toning, and noise reduction. Gradient Xterminator for gradient removal. Carboni Tools for additional saturation adjustments, noise reduction, and smoothing. HLVG for additional color correction. Registar for aligning stacks. 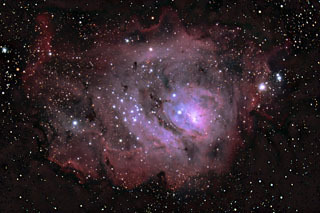 Notes This is the second time I've imaged the Lagoon nebula. My modified 450D camera did a much better job with this object than my old 20Da. The Lagoon Nebula has some very intricate details, and I'm very pleased with how well this image shows some of those details. This image won 1st place in Cloudy Night's November 2012 Imaging/Sketching contest.